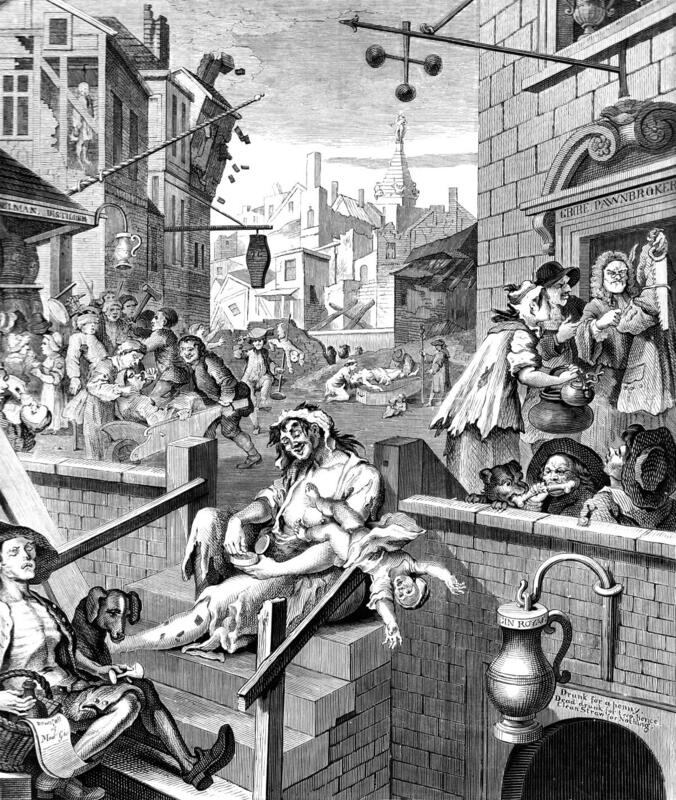 A visitor to Margate's Cecil Square last week, commented that what she saw there, reminded her of the iconic 1751 print, 'Gin Lane' by the artist William Hogarth in support of what would later become the Gin Act. That a visitor to the town should immediately think of William Hogarth, rather than William Turner, came as a personal shock but also perhaps as a rude wake-up call. Too often perhaps, we attempt to point at regeneration in one direction and ignore or dismiss the equally valid perceptions of others, who leave the town with the opposite impression of the many positive changes, people are working so hard to deliver. Tomorrow, Thursday, if you believe the press and social media, the Prime Minister, David Cameron, will be visiting the Turner Contemporary Gallery in the morning, seeing for himself, evidence of that same positive influence, the gallery has had over the town's regeneration since it opened. However, the spectre of Hogarth won't be too far away as anarchists and left-wing political activists from far and away are being encouraged to descend on Margate and 'Get Cameron.' 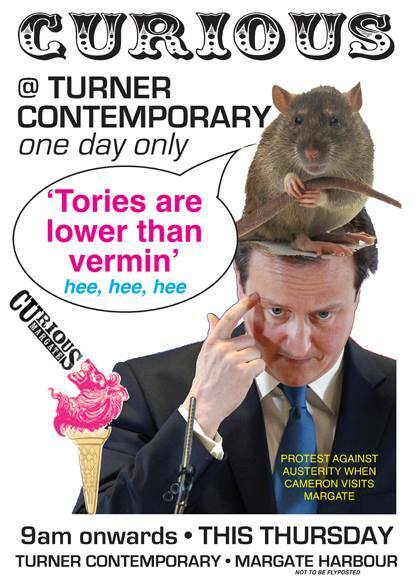 Here's an example of one of their more tasteful posters which labels 'Tories' like me as vermin. Reading through some of their materials, this all appears to be coming from Thanet's 'usual suspects' intent on 'Saving Our NHS' and proving 'The Myth' of austerity. A welfare state in perpetuity and at any cost, even if the huge sum of money to pay for what we have become used to over the last thirty years, no longer exists. Simple economics or indeed, history remains a mystery to many of those contributing to the 'Get Cameron' debate. Very few people realise that before WWII and the global introduction of wider income tax rates across the developed nations that followed it, countries normally lived within their limited means. This was broadly a consequence of income tax receipts and the amount of Gold held in central banks. Without going into a history lesson, what happened after the war, was the idea that the Government of one generation could borrow almost indefinitely and in unlimited sums from the Government of the next, to support capital expenditure, the growth of the public service and huge welfare-related projects such as the NHS. Such government borrowing, much like any pyramid investment scheme, was predicated on indefinite economic growth of at least 2.5% annually; forever with consistent taxation to match the burden of having half the population dependent on welfare payments of one form or another. 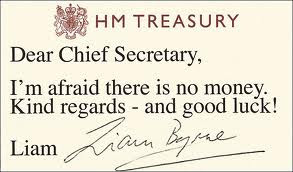 There was of course one big flaw in the this economic model as we have all subsequently discovered since the crash of 2008 and Labour Treasury Secretary, Liam Byrne left that famous note about the money having all been spent; we inherited the worst deficit in the G20 from the last government. The assets that any nation or business borrows against must have a value and in Europe's case, with plummeting GDP, there's very little left to raise money on and Greece, Portugal and Ireland are fine examples of the catastrophic consequences of out-of-control government borrowing. There's a much bigger picture of course so I will ask readers to forgive the over-simplification but what I'm trying to argue is that the protestors, are dreaming of some socialist Albanian utopia. One of long state holidays and unlimited welfare, where jobs are for life, State pensions forever and medicine is free. They are deceiving themselves, as they have done since George Orwell wrote Animal Farm. Even the Labour Party, has now conceded that it too will have to take a much harder line on welfare but consistently declines to say what its own plans for austerity might be. What is true however, is that any Government of any colour, after the General Election of 2015, is going to have to cut even deeper than today because we have still only scratched the surface of austerity regardless of what the 'Get Cameron' protesters might believe. when I have spoken with their like before, I've found them to be quite uninterested in economic facts but class-obsessed with a fantastical sense of social entitlement, which lies at odds with my own. Step no further than a conversation with Labour's Cabinet Member, Cllr Fenner and you'll know what I mean. On reflection. It would be nice if the event of our Prime Minister visiting Thanet and in particular Margate tomorrow morning, was seen as a recognition of the efforts of many hard-working people, in making steady and significant progress towards the regeneration of the town. I do however fear that any visit will be spoiled by those intent on making a point on a political argument which has all the relevance today of the famous Luddite protests at Rawfold Mill in 1812. I'm thinking of starting a "Get Moores" group, anyone fancy joining me? Of coarse people can choose not to work if that's what they want, but they shouldn't expect the rest of us to pick up the bill. Perhaps these seekers of a socialist paradise could find El Dorado, where all the gold that the member for Kirkaldy and Cowdenbeath sold at a discounted rate, is stored. In my layman mind I can understand your argument and explanations, how come the likes of the two Eds can't, or more likely won't admit that they got it wrong for so long? 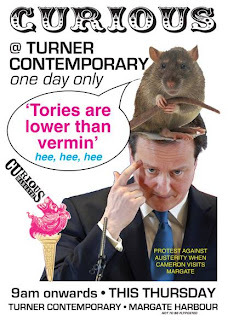 Has anyone mentioned to David Cameron, that the Turner Contemporary is closed on Thursdays. He will have to visit the Shell Grotto instead then? Thought Turner was open every day except Monday, though I did hear somewhere that this particular Thursday it is closed for a function. Perhaps Cameron is the function. I went down to the Turner Contemporary around 6 months ago, said it was closed Thursdays. Could of changed by now, so I could be wrong. Bring Cameron here to Westgate. lunch at Mollies, and lots of goodies from Piro's for all at number 10 and 11. Then Roger can go back with him on the train, to explain the benefits of a high speed rail link. Thursdays are my day off and I have been visiting the Turner Contemporary regularly on Thursdays and writing blog posts about the gallery since it opened, you can click here to read them if you want. If all countries lived within their means before WWII as you suggest could you explain in your famous layman's terms why there were several episodes of rampant inflation and economic depression amongst supposed civilised countries in the 20s and 30s. You do many of us an injustice by your ultra right wing views of the left and centre, but what do we, the great uneducated know? By the way 12.48 Mollies closed following the no tesco vote for Westgate. 2:40 I could explain in more detail, "The New Deal" in America perhaps and the fundamental differences between the economic theories of the three economists, Keynes, Friedman and Hayek, who have shaped the world in which we live but I suspect I might be over-egging the cake! Let's take the United States as an example. yes you had the great depression but that was a consequence of unrestrained speculation and the collapse of many hundreds of banks. I would need to look it up but I recall that mass income tax didn't appear in the and the USA until about 1941 and while the "New Deal" sounded good in principle, it also created protectionism and monopolies which were very bad indeed for the US economy. People often hold Nazi Germany up as an example of the efficient centrally controlled state but that too, was in reality a disaster, as Hitler was the economic equivalent of a one-legged man on a bicycle pedalling towards the inevitability of war. Germany was effectively bankrupt in 1939 thanks to its corrupt Nazi controlled interference in the economy and it had to go war or face the modern equivalent fate of Greece. I hope this isn't all too much for you and 'Yes' I take your point on depression and economic collapse but if you care to read what I actually wrote about borrowing, as opposed to what you think I wrote, they are quite separate. Until roughly WWII, the size of Government throughout the developed world was constrained by what Government could draw down from much more limited taxation and the value of its Gold reserves. After the War, with huge war debts to pay, Governments followed a new path towards borrowing against the future, which in turn led to the explosion in size of the State that we see around us today. I was only in Station Road on Monday getting my hair cut, I didn't even realise Mollies had gone. Thats very sad news. Hope Piro's is still there, they had loads of great tasty goodies. Surely it was the treaty of versailles that dealt an economic blow to Germany and the economy collapsed in the early 20s. They were bailed out by massive loans from the US between 1923 and 1929 when they certainly lived beyond their means. The crash of 29 saw an end to the loans and by 1931 avlot of German banks had collapsed. This left the void for the Nazis to take power with what seemed a sound financial system built on quicksand, but the people believed it. So the problems in Germany started long before the Nazis as you suggest. ... and there lies the big problem with many local small stores 12:48 / 4:15: People moan that Tesco or Sainsburys will (supposedly) close them, yet the vast majority of people rarely ever use these small shops anyway! Good blog! I like it! The ex-Mollie's site is currently being refurbished and will apparently be re-opened as a cafe. Retail premises in Westgate are rarely empty for long which helps to ensure that our community spirit thrives. Long may it remain a friendly 'village' type environment. Not point scoring, just adding fact to to an over simplification by your good self. How's the campaign to reintroduce trees to the Westgate shopping area coming along? I haven't heard any more since tesco dropped out, so I do hope this will still happen. I'm afraid you have completely missed the argument 7.25 which is very clear in the text. If you can't grasp that, oversimplified or not, I really can't add anything further. Sorry but I'm not aware of a campaign to reintroduce trees. Lovely idea but where I wonder ? I have grasped the gist of your comment but it is an inaccurate statement regarding the pre-war situation, thus causing basic flaws in your arguement. Anyone with even a basic knowledge of economics and world affairs knows that the prewar situation you describe is far from the truth. Keynes was, I believe a leading critic of many pre-war economies resulting from reparations post WW1. Where they were before of course. Or don't you think it's such a good idea to try to restore the place to how it was originally envisaged? I thought the argument against Tesco was along those lines. 8:21 .. Sadly not I'm afraid, which is perhaps why I do what I do and you do what you do. We should leave this somewhat fruitless exchange there. 8:22 you have lost me. That was 1905 and as much as we might like to see it, it's not coming back anytime soon. The best we can do is defend what we have left in the town. Must admit. It has been a while since the Treaty of Versailles has been on my radar. A great political point - dont push them too hard or they push back. But that was nearly 100 years ago. Can we not get into talking about the here and now? Can we not all work for the good of Thanet, or do we all need to score historical, political points? The Treaty of Versailles has absolutely nothing to do with the problems of the present. Big Government, low growth and a reduced tax base does. Unless we find a magic way of conjuring growth back above 2% on a consistent basis, austerity is here to stay. I'm not a scholar or economics, but I understand some simple mathematical equations - such as a non receipt of funds is not income, but a debt and should be recorded as such on your balance sheet. Westgate is kind of strange business wise. Lots of competing Cafe's and Womens hair & Beauty salons. What we need is a real mans shop down that end. Some kind of tech/gadget orientated big boys toys perhaps. West Station road becomes the ladies department, and East Station road becomes the Mens department.